For many of us, getting a physical is a yearly routine. Some walk away from the doctor’s office with thoughts of praise about their report. While others already know what the doctor is going to say even before getting out of the car. For some, the doctor is telling us to lose weight. You have tried to eat healthy, but you have arrived at a plateau, and the weight is no longer coming off. You know you need to exercise, but your joints hurt with only thinking of running shoes or getting on a bike. But there’s no reason for despair. There’s a solution to getting a cardiovascular workout, and the answer is the trident adult recumbent tricycle. What makes a recumbent trike so special? Well, I’m glad you asked. A recumbent tricycle has a low center of gravity, meaning that those with hip and knee surgeries can get a great heart-invigorating workout without fear of falling. What makes the Trident trike stand out is the 24 speed 3X8 drivetrain, allowing you to not only keep up with the joggers on the bike path but even leaving them behind in your dust. Another astounding feature is the folding frame, allowing you to easily transport your bike in your car as you drive yourself to one of your favorite secluded spots where it’s just you and nature. The folding frame also allows you to store your recumbent tricycle in the closet or hanging by a hook instead of the basement, so less strain on your back from having to carry your bike up the stairs. The steering is phenomenal as well. There is no brake steer nor is there a pedal steer, meaning you could handle the bike with only one hand on the bars. 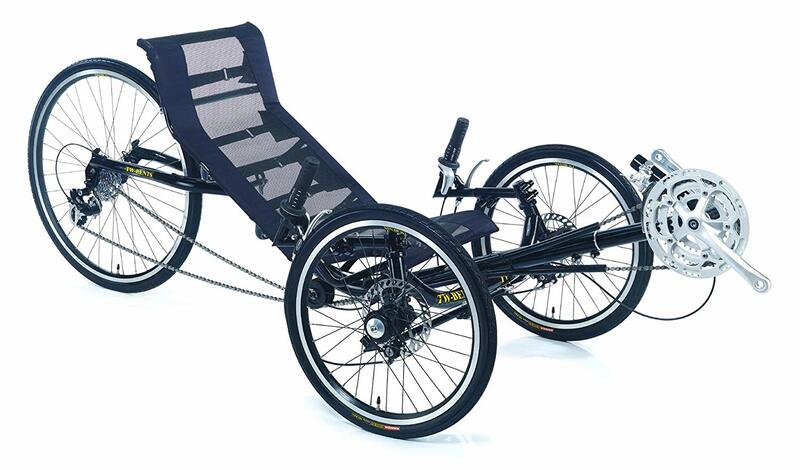 What are others saying about the Trident recumbent trike? Is it better than a similar reclining trike? One reviewer raved about how he could change gears while biking on the beach. The one caveat he mentioned was to change the skinny tires to fat tires if your purpose is to ride on sand. The same reviewer took his bike on only short distances and loved the freedom of going to various places while on vacation. He also felt the bike was affordable. 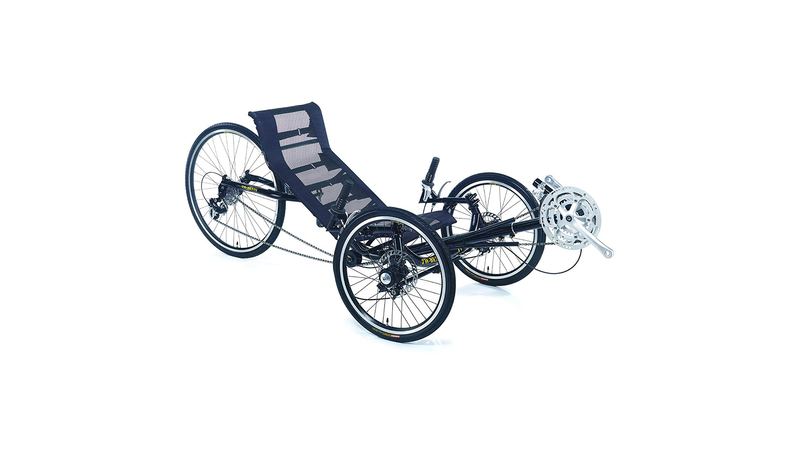 Another review commented it only took a minute to fold the recumbent tricycle and said it was light and responsive. If you have certain medical conditions preventing you from riding an upright bike or you want to get away from the crowd while on vacation, then the Trident Adult Recumbent Tricycle is for you. 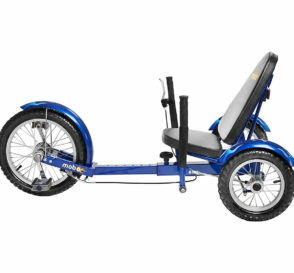 If you have a child who can’t use an upright bike and you want to promote a heart-healthy activity, then you need to purchase a Trident Adult Recumbent Tricycle. Think of all the places you can explore on vacation. You can easily fit the Trident trike into the back seat or the trunk of your car as you travel to your favorite beach or another secret place away from the daily pressures of life. How many can other recumbent tricycles change gears? Can you think of others with a folding frame, allowing for easy transport and storage? The next step is to go online, or go to your favorite bike shop and purchase your astounding Trident Adult Recumbent Tricycle before others get the same idea. Great ahead of the game and get ready for the warm weather that is sure to come. Plan your vacation with having a reliable bike allowing you to explore new areas. Your heart and your emotional well-being will thank you.